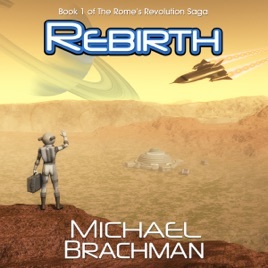 Rebirth (Book 1 of the Rome’s Revolution Saga) chronicles the adventures of Rei Bierak, a young man from the 21st century who wakes up 14 centuries from now only to discover everything he knows about the universe is wrong and that he is nothing but a despised relic from the long-dead past. Rei, along with 542 other humans, was frozen and launched in the Ark II toward the stars with the hope of establishing a colony on a habitable world in the Tau Ceti system. During Rei’s long trip, modern civilization has collapsed, and society has reformed into a decidedly different model. The 24-chromosome mind-connected humans of the future called the Vuduri are efficient, indifferent, and emotionally deficient. Devoid of nearly all the traits that make us human - art, music, even speaking - the Vuduri have conquered faster-than-light travel and have established an outpost in the Pi3 Orionis system (aka Tabit) to study why certain stars are disappearing. Awakening 1,388 years in the future, Rei meets Rome, a beautiful half-breed Vuduri woman who is eventually ostracized for consorting with him. Rei and Rome are joined by OMCOM, a supercomputer with delusions of omnipotence. Together, they fend off a hostile society, saboteurs, and technology indistinguishable from magic. The fate of humanity, perhaps even life itself, hangs in the balance. Rome’s Revolution is a three-part interstellar adventure featuring a man from the 21st century and a woman from the 35th century who band together to fight forces dedicated to the extinction of mankind. Cinematic in scope, Rome’s Revolution offers romance, comedy, heart-pounding thrills, suspense, “legal” time travel, and meticulously researched hard science. It is a love story and a culture clash. The entire Rome’s Revolution Saga has everything you love about hard science fiction: robots, aliens, computers, genetic manipulation, spaceships that travel faster than light, and some that travel a lot slower.